In 1837, Charles Babbage designed a general purpose computer, the Analytical Engine, but never built it. Between 1934 and 1937, Church, Turing et al. defined the general purpose computer, but didn’t design one. In 1941, Konrad Zuse built the first general purpose computer, the Z3, but didn’t know it was general purpose and didn’t use it that way. From 1943 to 1946, Mauchly and Eckert finally built a computer, ENIAC, that was designed to be general-purpose. This entry was posted in archeology, trivia on April 20, 2010 by Michael Steil. If you type “WAIT6502,1” into a Commodore PET with BASIC V2 (1979), it will show the string “MICROSOFT!” at the top left corner of the screen. Legend has it Bill Gates himself inserted this easter egg “after he had had an argument with Commodore founder Jack Tramiel”, “just in case Commodore ever tried to claim that the code wasn’t from Microsoft”. In this episode of “Computer Archeology“, we will not only examine this story, but also track down the history of Microsoft BASIC on various computers, and see see how Microsoft added a second easter egg to the TSR-80 Color Computer – because they had forgotten about the first one. This whole story sounds similar to Apple embedding a “Stolen From Apple” icon into the Macintosh firmware in 1983, so that in case a cloner copies the ROM, in court, Steve Jobs could hit a few keys on the clone, revealing the icon and proving that not just a “functional mechanism” was copied but instead the whole software was copied verbatim. Let’s dig into the history of Microsoft’s BASIC interpreters. 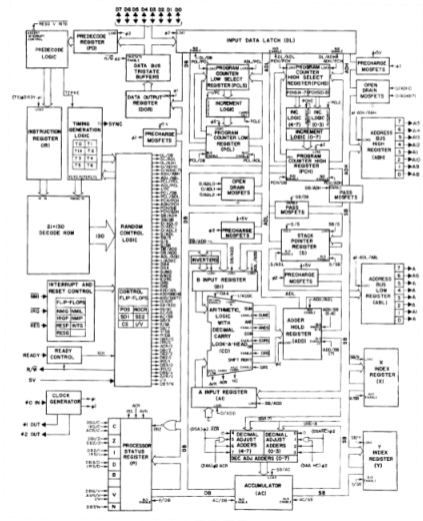 In 1975, Microsoft (back then still spelled “Micro-soft”) released Altair BASIC, a 4 KB BASIC interpreter for the Intel 8080-based MITS Altair 8800, which, despite all its other limitations, included a 32 bit floating point library. An extended version (BASIC-80) that consisted of 8 KB of code contained extra instructions and functions, and, most importantly, support for strings. 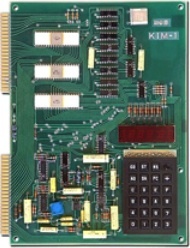 In 1976, MOS Technology launched the KIM-1, an evaluation board based around the new 6502 CPU from the same company. 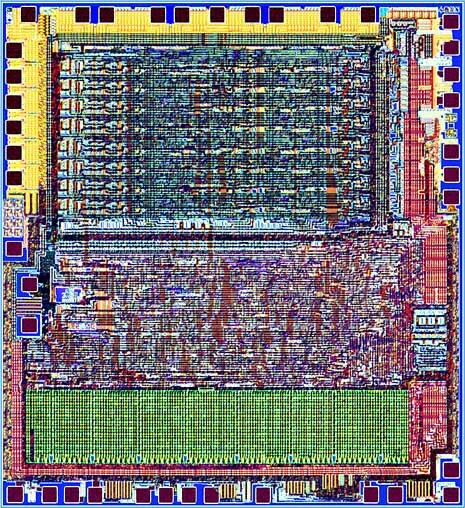 Microsoft converted their BASIC for the Intel 8080 to run on the 6502, keeping both the architecture of the interpreter and its data structures the same, and created two versions: an 8 KB version with a 32 bit floating point library (6 digits), and a 9 KB system with 40 bit floating point support (9 digits). 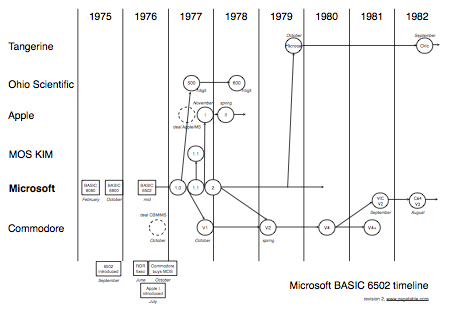 Some sources claim that, while BASIC for the 8080 was 8 KB in size, Microsoft just couldn’t fit BASIC 6502 into 8 KB, while other sources claim there was an 8KB version for the 6502. The truth is somewhere in the middle. 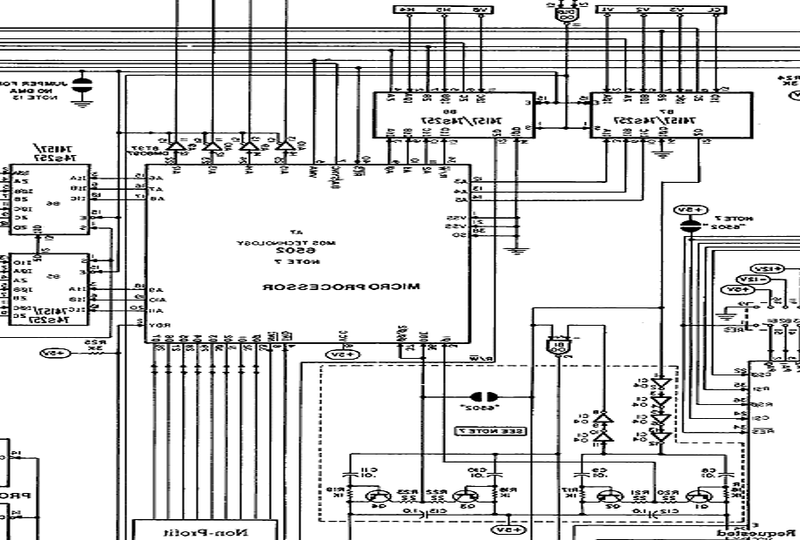 The BASIC ROMs of the Ohio Scientific Model 500/600 (KIM-like microcomputer kits from 1977/1978) and the Compukit UK101 were indeed 8 KB in size, but unlike the 8080 version, it didn’t leave enough room for the machine-specific I/O code that had to be added by the OEM, so these machines required an extra ROM chip containing this I/O code. In 1977, Microsoft changed the 6 digit floating point code to support 9 digits and included actual error stings instead of two-character codes, while leaving everything else unchanged. A 6502 machine with BASIC in ROM needed more than 8 KB anyway, why not make it a little bigger to add extra features. The 6 digit math code was still an assembly time option; the 1981 Atari Microsoft BASIC used that code. The 1976 Apple I was the first system besides the KIM to use the MOS 6502 CPU, but Steve Wozniak wrote his own 4KB BASIC interpreter instead of licensing Microsoft’s. An enhanced version of Woz’ “Integer BASIC” came in the ROM of the Apple II in 1977; Microsoft BASIC (called “AppleSoft”) was available as an option on tape. On the Apple II Plus (1978), AppleSoft II replaced Integer BASIC. Commodore had bought MOS in October 1976 and worked on converting the KIM platform into a complete computer system. 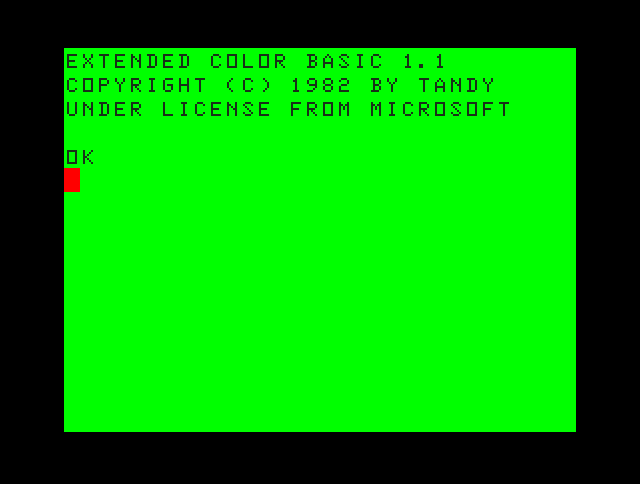 They licensed Microsoft BASIC for 6502 (also October 1976), renamed it to Commodore BASIC, replaced the “OK” prompt with “READY.”, stripped out the copyright string and shipped it in the ROMs of the first Commodore PET in 1977. 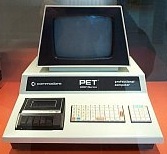 In 1979, Commodore started shipping update ROMs with a version 2 of Commodore BASIC for existing PETs. Apart from updates in array handling, it also contained the WAIT 6502 easter egg. Commodore engineers are known for putting easter eggs into ROM, but there would be no reason for them to encode the string “MICROSOFT!” and hide it so well. The “WAIT 6502” easter egg did not show up in Commodore BASIC until version 2, which is in contrast to almost all sources claiming Commodore licensed Microsoft BASIC for a flat fee and never returned to Microsoft for updates, but continued improving BASIC internally. 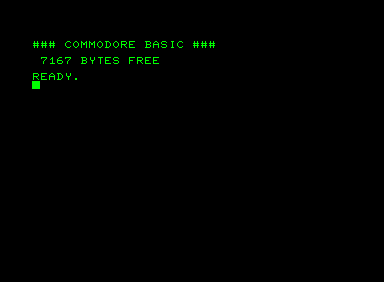 Commodore paid Microsoft an additional fee to write a revision to the original BASIC that they had bought. Among other things, spaces-in-keywords were changed, zero page shifted around, and (unknown to Commodore) the WAIT 6502,x joke was inserted. 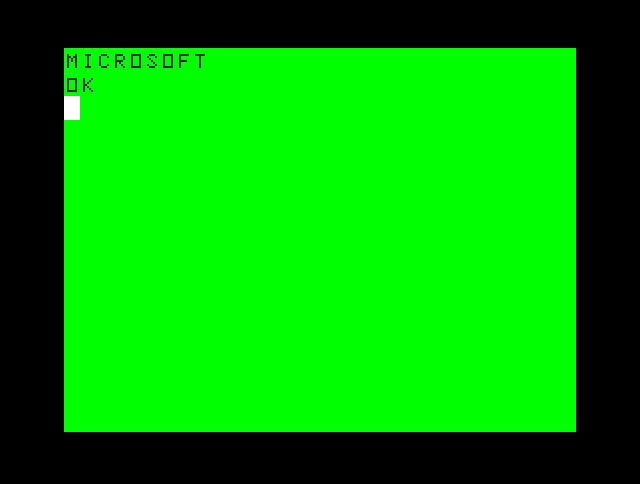 While all of Microsoft BASIC only depends on the CPU, makes no other assumptions on the hardware it runs on (be it Commodore, Apple, Atari, …), and does all its input and output by calling into ROM functions external to BASIC, the easter egg writes directly to screen RAM at a fixed address of $8000, and uses the PET character encoding for it: The easter egg has clearly been written specifically for the PET. We can only speculate on the reasons why Microsoft and possibly Bill Gates himself added the easter egg. A possible reason is that Microsoft wanted to make sure Commodore cannot take credit for “Commodore BASIC” – similar to the “Stolen From Apple” case. Or it was only about showing the world who really wrote it. Jim Butterfield: As an afterthought, Microsoft would have liked to see their name come up on the screen. But it wasn’t in the contract. The easter egg only exists in BASIC version 2 on the PET. All later Commodore computers didn’t contain it: The branch was restored and the extra code as well as the 10 bytes hidden after the SIN() coefficients were removed. Commodore employee Andy Finkel states that the “Gates” (!) easter egg had to be removed for space reasons. It had occupied 51 extra bytes. According to Jim Butterfield, this is probably due to negotiations concerning Microsoft BASIC for the Amiga.
.;3FC9 A6 D3 C1 C8 D4            "!TFOS"
. 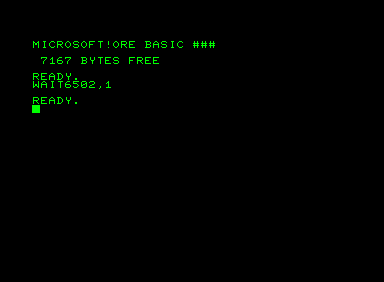 ;3FCE C8 D5 C4 CE CA            "ORCIM"
The version of Microsoft BASIC for the 6502-based Apple II, called “AppleSoft“, contains the same 10 bytes after the coefficients in all tape and ROM versions. On AppleSoft II, for example, they are located at address $F075. KIM-1 BASIC was released in 1977, AppleSoft II in spring 1978, and the V2 ROM of the PET in spring 1979. So Microsoft didn’t “target” Commodore with this at first, but probably put the data in for all their customers – possibly right after they had shipped the easteregg free V1 to Commodore. And when Commodore came back to them, they changed their codebase to encode string differently and added the easter egg code to show the string. 0000fd8: 0f da a2 a1 54 46 8f 13  ....TF.. The ROM of the Ohio Scientific Superboard II (and its clone, the Compukit UK101) as well as the Atari Microsoft BASIC tape are based on the 32 bit floating point version and don’t contain the easter egg data. BFC8 84 E6 1A 2D 1B    LBFC8   FCB   $84,$E6,$1A,$2D,$1B   * -((2*PI)**11)/11! BFCD 86 28 07 FB F8    LBFC8   FCB   $86,$28,$07,$FB,$F8   *  ((2*PI)**9)/9! BFD2 87 99 68 89 01    LBFD2   FCB   $87,$99,$68,$89,$01   * -((2*PI)**7)/7! BFD7 87 23 35 DF E1    LBFD7   FCB   $87,$23,$35,$DF,$E1   *  ((2*PI)**5)/5! BFDC 86 A5 5D E7 28    LBFDC   FCB   $86,$A5,$5D,$E7,$28   * -((2*PI)**3)/3! You can tell that Microsoft didn’t reimplement BASIC for the remaining 8 bit architectures, but practically converted the 6502 code, copying all constants verbatim, even the ones they did not understand, since these are still the obfuscated bytes in PET-encoding. The TSR-80 Color Computer (1980) also has an easter egg in BASIC: If you type “CLS9” (or any higher number), it will clear the screen and print “MICROSOFT”. A918 C1 08                CMPB #8        VALID ARGUMENT? That’s right, Microsoft added a different easter egg, and included the string “MICROSOFT” again, this time in cleartext. They seem to have forgotten about the obfuscated 10 bytes intended for the PET that had been copied from the 6502 version to the 6800 during conversion, and had still been present in the Color Computer ROM. FBC4 C1 08                CMPB #$08       ; easter egg? FBEA 7E E7 A8             JMP $E7A8       ; print "MICROSOFT"
F834 4D 49 43 52 4F       FCC "MICROSOFT"
F724 A1 54 46 8F 13       FCB $A1,$54,$46,$8F,$13 ; "!TFOS"
F729 8F 52 43 89 CD       FCB $8F,$52,$43,$89,$CD ; "ORCIM"
Version 1.0 (in the 6 digit version) is used on the Ohio Scientific, and contains a major bug in the garbage collection code. Version 1.0 (in the 9 digit version) is also used in the first Commodore PET as Commodore BASIC V1. It is the oldest known Microsoft BASIC to support 9 digit floating point. Version 1.1, which contained bug fixes, is used on the KIM-1. It is the oldest version to contain the “MICROSOFT!” string (in ASCII). AppleSoft BASIC I is forked from Microsoft BASIC 1.1. It contains the ASCII string. Microsoft BASIC version 2 changes the ASCII string to PET screencode, adds the easter egg code, and is given to Commodore. The code is removed again after the source drop to Commodore. The Tangerine Microtan is based on this. Apple, Commodore and Tangerine continue development of their respective forks without the involvement of Microsoft. The BASIC V2 used on the VIC-20 and the C64 is actually a stripped-down version of PET BASIC 4.0 and not a ported version of PET BASIC V2. So did Bill Gates write it himself? 00560  PAUL ALLEN WROTE THE NON-RUNTIME STUFF. 00580  BILL GATES WROTE THE RUNTIME STUFF. 00600  MONTE DAVIDOFF WROTE THE MATH PACKAGE. Bill Gates wrote “the runtime stuff” (which probably means the implementation of the instructions), as opposed to “the non-runtime stuff” (probably meaning tokenization, memory management) and “the math package”. Consequently, the implementation of the WAIT command would have been his work – on the 8080, at least. Now who wrote the 6502 version? The KIM-1 BASIC manual credits Gates, Allen and Davidoff, the original authors of the 8080 version, but it might only be left over from the manual for the 8080 version. Davidoff, who worked for Microsoft in the summers of 1975 and 1977, had not been there when BASIC 6502 was written in the summer of 1976, but he probably changed the 6 digit floating point code into the 9 digit version that is first found in BASIC 6502 1.1 (KIM-1, 1977). The ROM of the 1977/1978 Ohio Superboard II Model 500/600 (6 digit BASIC 1.0) credits RICHARD W. WEILAND, and the 1977 9 digit KIM-1 BASIC 1.1 as well as the 1981 Atari Microsoft BASIC 2.7 credit “WEILAND & GATES”. Ric Weiland was the second Microsoft employee. These credits, again, were easter eggs: While they were clearly visible when looking at the ROM dump, they were only printed when the user entered “A” when BASIC asked for the memory size. According to apple2history.org, Marc McDonald (employee number 1) wrote the 6502 version, but it is more likely that McDonald wrote the 6800 simulator and Weiland ported 8080 BASIC to the 6800 and then McDonald adapted the 6800 simulator to the 6502 and Weiland wrote the 6502 BASIC. 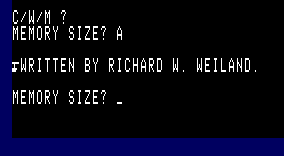 This and the hidden credits in version 1.0 of 6502 BASIC suggest that Weiland was the main author of 6502 BASIC. Gates is added to the hidden credits in the 1.1 version, so Gates probably contributed to the 1.1 update.. So it is very possible that Gates wrote the easter egg code himself, given that he was responsible for the implementation of WAIT on the 8080, he is credited in BASIC 6502 1.1+, Finkel and Butterfield refer to WAIT6502 as “Gates'” easter egg – and after all, he can write code. What was Atari’s version based on? What versions were there? Atari Microsoft BASIC images are very hard to find. Why did Atari use the 6 digit version, if they extended it with lots of commands (so size couldn’t have been an issue)? This entry was posted in 6502, archeology, trivia on September 30, 2008 by Michael Steil. 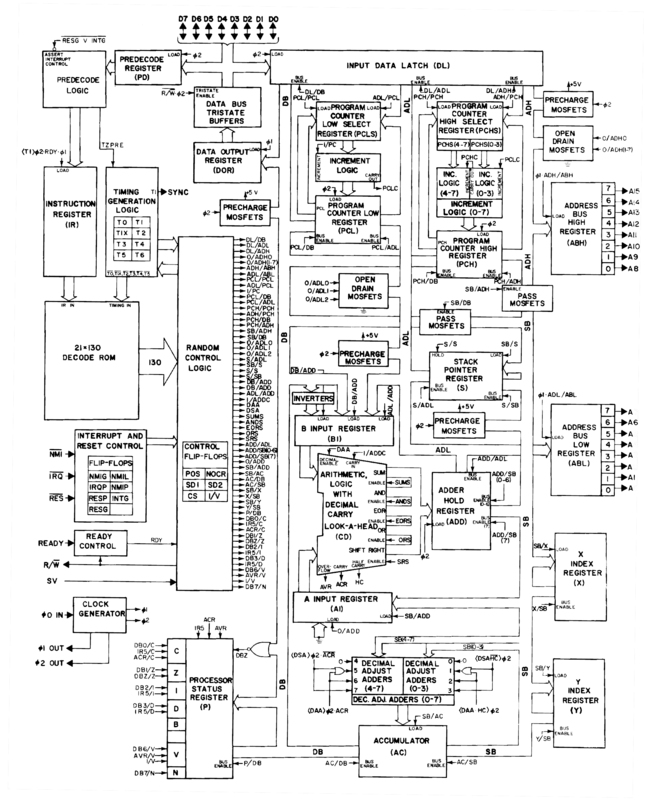 Itâs easy to read the mirrored text âMICROPROCESSORâ, and if you pay close attention, you can read â6502âł – a classic 8 bit CPU which has been featured in pop culture before. The schematic was shown in the background video in Los Angeles (10 Dec 2007) and San Francisco (11 Dec 2007), but IIRC not in Frankfurt (28 Aug 2007; I think I would have noticed), so it seems to be new in Toolâs Fall 2007 Tour. This entry was posted in 6502, trivia on December 12, 2007 by Michael Steil.